On September 20, 2009, the beaches of Kiawah Island will once again resound with the steady drum of horses hooves as the Town of Kiawah, the Kiawah Island Community Association and the Kiawah Island Club welcome the island’s first Polo match. Although the Great Kiawah Island Horse Race was held at various times between 1976 and 1984, the amateur and professional competitions ended in 1984 when the Kuwaiti-owned Kiawah Island Company decided to discontinue the races. “They weren’t really that impressive,” said Betty Stringfellow, an island native and noted Johns Island historian, in regard to the Great Races. “The competitors would draw a line in the sand and half the time, the riders couldn’t get their horses to stand behind it, let alone start when they were supposed to.” However, horses were an important part of island life until recently. “By 1900, nearly every landowner, black or white, had a gaited horse and a gig,” Stringfellow recalled. “When they met in the roads, a race was on. The greatest gift you could give a child was a colt from one of these horses.” However, the thoroughbreds disappeared from the islands for a time, to be replaced by the reliable, tireless Marsh Tackys – the smallish, native horses which were excellent for plowing the fields, riding and pulling carriages. It wasn’t until the turn of the century that thoroughbred horses returned to the islands, mainly for pleasure riding. Stingfellow fondly recalls riding her Marsh Tacky along the shores of Seabrook Island during World War II, though it wasn’t exactly allowed. A mounted unit of 15 armed soldiers was constantly on patrol of the beaches, keeping an eye out for German U-boats. 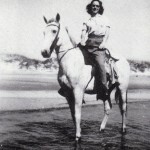 When she rode her horse to the shore for a gallop, the soldiers would call out, “It’s only Betty!” so the young girl wouldn’t be mistaken for an enemy soldier. The Polo competition, however, will be unique as well as retrospective. Native Charlestonian and S.C. Representative Chip Limehouse, who says he is coming out of retirements just for this event, will be joined by his brothers Brad (who plays professionally) and Brien as one of the exhibition’s two competing teams. The trio’s father, State Transportation Secretary Buck Limehouse, will serve as the match’s announcer. A reception and game celebration will be held at the Beach Club both before and after the competition. The match itself, which will be held from 3 – 5pm, is open to Kiawah Island residents, but tickets to the Polo Party are $60 each. The party will begin with an opening reception at 2pm, followed by a showing of the Polo ponies. After the competition, the party continues from 5 – 8:30pm with champagne, heavy hors d’oeuvres and music by the East Coast Party Band. To purchase tickets or for more information, call 768-9194 or email Roshonda.Brown@kica.us Mastercard, Visa, personal check, and cash will be accepted.